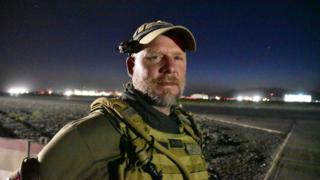 A veteran US photojournalist and a translator have been killed in Helmand province in southern Afghanistan. Two other NPR employees travelling with the pair were unharmed, the US public radio network said in a statement. The vehicle Mr Gilkey, 50, and Mr Tamanna, 38, were travelling in was struck by shellfire near the town of Marjah, NPR said. Mr Tamanna was a photographer and journalist in Afghanistan, as well as a translator. He said: "David has been covering war and conflict in Iraq and Afghanistan since 9/11. He was devoted to helping the public see these wars and the people caught up in them. He died pursuing that commitment. "As a man and as a photojournalist, David brought out the humanity of all those around him. He let us see the world and each other through his eyes." Mr Gilkey is the first US journalist outside the military to be killed in the conflict in Afghanistan. He received a series of awards during his career, including a 2007 national Emmy for a video series about US Marines from Michigan serving in in Iraq. In 2011, he was named still photographer of the year by the White House Photographers' Association, one of nine first-place awards he received from the body. Last year, he received the Edward R Murrow Award for his coverage of international breaking news, military conflicts and natural disasters.